For a disease like ALS that has no cure and few effective treatments, research is a tremendous source of hope. For the second year running, the ALS Canada Research Program presented a free Virtual Research Forum open to anyone interested in learning more about some of the ALS research currently underway and therapies in development. Hosted by Dr. David Taylor, VP Research at ALS Canada, the Virtual Research Forum featured more than twenty speakers and panelists and took place over two days. Select presentations from the Virtual Research Forum are available for on-demand viewing below. If you’re interested in the world of ALS research, you may also be interested in ALS Canada’s 2018 Virtual Research Forum. Join Canada’s world-class ALS research community, international ALS researchers and experts for a half-day of live presentations. There is more to be hopeful about today than ever before – learn what dedicated, passionate and relentless researchers are doing toward a future without ALS. The Virtual Research Forum will take place on Wednesday, October 17 from 9 a.m. to 4 p.m. Mountain Time and it’s free to access and open to all. How is the global ALS research community working together to stop ALS? Are identical twins with the exact same DNA truly identical when it comes to disease onset and progression? What if someone living with ALS could use brain-computer interface technology to turn thoughts into computer commands? Get answers to these questions and more by clicking here to register. How Canadians’ generosity from the Ice Bucket Challenge is making a difference. Please join in a free webinar presented by Dr. David Taylor, VP, Research at ALS Canada. 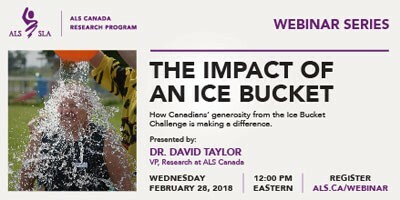 During this webinar, you can expect to learn about how funds from the Ice Bucket Challenge were invested in Canada and what the expected impact will be for ALS research. There will be an opportunity to ask questions at the end of the webinar. The webinar will be moderated by Dr. David Taylor, Vice President Research for ALS Canada, which is sponsoring the webinar. He will provide a brief overview of edaravone, masitinib, NurOwn, tirasemtiv and other experimental treatments currently in clinical trials. Questions for the panel can be submitted in advance by email to research@als.ca or during the webinar itself using the webinar control panel. Questions can be submitted either in English or French. For a disease like ALS that has no cure and few effective treatments, research is a tremendous source of hope. For the second year running, the ALS Canada Research Program is presenting a free Virtual Research Forum open to anyone interested in learning more about some of the ALS research currently underway and therapies in development. Hosted by Dr. David Taylor, VP Research at ALS Canada, the Virtual Research Forum will feature more than twenty speakers and panelists and will take place over two days. How to attend: All you need to participate is a computer with internet connection and audio capabilities via a telephone or computer. Advance registration is recommended because spots are limited. Please note that you must register separately for each day. You can attend as many or as few sessions as you like, and you can sign on and off as suits your schedule. The Virtual Research Forum will be conducted in English, with two speakers – Bastien Paré from Laval University and Elsa Tremblay from l’Université de Montréal – who are able to take questions in French. We will be identifying future opportunities to offer research updates in both official languages. See below for an agenda to help you plan your attendance. As the agenda is finalized we will post updates on Facebook and Twitter to keep you up to date. Register now for the Virtual Research Forum: Wednesday, August 9 and Thursday, August 10. For more information, please contact research@als.ca. Clinical Roundtable: Dr. Wendy Johnston (University of Alberta), Dr. Colleen O’Connell (Dalhousie University), Dr. Angela Genge (Montreal Neurological Institute), Dr. Christen Shoesmith (London Health Sciences Centre), etc. Research projects marked with an asterisk (*) have been funded thanks to the generous support of donors across Canada and the provincial ALS societies. Preclinical Roundtable: Dr. Ian Mackenzie (University of British Columbia), Dr. Christine Vande Velde (Université de Montréal) etc. The provincial ALS Societies have been funding important ALS research for over thirty years. This webinar will discuss the history of Canada’s research funding through to the current program, which has grown substantially in recent years. There is currently more research to be done than funding available, so the webinar will also explain Canada’s approach to research funding, which is focused on maximizing the impact of donor dollars by awarding grants to projects believed to offer the most promise to advance the field of ALS research. In Canada, we are privileged to have an exceptional ALS research community that is actively contributing to advancing the global field of ALS research. This webinar will provide an overview of the Canadian ALS research community and highlight examples of ALS researchers and projects that contribute to the high-quality research being done in Canada. Much of this important Canadian ALS research would not be possible without the generous support of donors. Dr. Kalra is a world expert on using advanced brain imaging techniques to better understand ALS. His work is primarily focused on the potential to find a biomarker that would allow physicians to detect the disease earlier, monitor disease progression and evaluate new therapies. Such a tool would likely both accelerate treatment testing and make new treatments more effective by providing a means of earlier intervention. In recent years, Dr. Kalra has collaborated with ALS clinicians across the country to develop a standardized Canadian platform of high powered brain imaging through a consortium called The Canadian ALS Neuroimaging Consortium (CALSNIC). Setting up this cross-Canada imaging network is funded through the largest ever grant provided by the ALS Canada Research Program, as a successfully peer reviewed application to the ALS Canada-Brain Canada Arthur J Hudson Translational Team Grant competition in 2015. This webinar will introduce CALSNIC, the researchers involved and demonstrate many of the fascinating techniques used to look for imaging biomarkers. An opportunity to ask Dr. Kalra questions will be available after the webinar.